After 2 computer crashes, countless re-writes, and a heavy teaching schedule, I finally finished my newest tutorial – 2 Hinged Cages and a Locket. It grew much larger than I originally planned, with 3 FULLY ILLUSTRATED variations. I seriously considered separating out the Locket variation as a stand alone tutorial, but the “leave it in” part of my brain won the toss. This tutorial teaches you step by step how to create a basic hinged cage, with or without beaded embellishments. This is a wonderfully versatile design to hold a favorite stone, maybe a love note, or a treasured trinket. Once it is on a chain, it is virtually impossible to come open by accident. 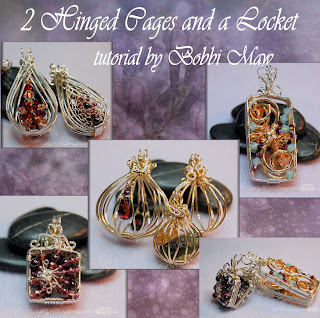 As a bonus this tutorial also includes 2 COMPLETE step by step variations including a crossed wire and locket style cage. The owner of a local bead shop showed me the mechanics of the hinge close to 15 years ago. A very dear friend of mine, Master Wire Worker Ed Sinclair, created a published one in 1994. He has generously given me permission to share my versions of the basic cage and a crossed wire technique that he developed years ago. This is an advanced level tutorial – it assumes you are familiar with basic wire techniques and improvising when needed. It is 28 pages with 67 steps and over 100 crisp, clear photographs. The file size is 2.3MB. Don’t be intimidated by the length and number of steps – This tutorial covers 3 FULLY illustrated pieces. While this is an advanced level tutorial, intermediate wire workers with a solid foundation of basic wire wrapping skills can, with patience, complete this design.